::: Off the Radar :::: Why does it take TWO years? ... for an album to come stateside? I still do not understand it. Money is at the root. Or lack there of. But it still does not make sense. There are popular/respected/established artists that still only see their albums released as $30 "import" editions. Perhaps this will change as digital music takes a stronger hold on the market. But I am still a sucker for a nicely packaged album. Have you seen the 3D cover for Arcade Fire's Neon Bible? The faux suede cover of The Beach Boys Pet Sounds? Or Radiohead's "book versions" of Kid A and Amnesiac? 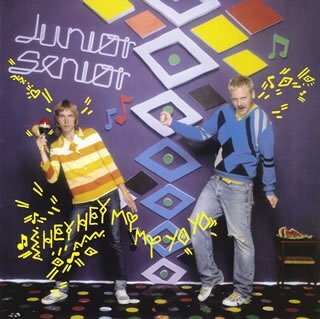 Junior Senior had their last album (released in Japan in 2005) shelved for U.S. release until this year! 2 years later. What changed? Anyways, their album is finally coming out here in August minus the import sticker price. The single sees them growing up a bit and throwing a little more vocal, a little more Chromeo (not as shiny though so we got some variety), and definitely some funk. They get a little help from Cindy Wilson and Kate Pierson of The B-52's!! By the end of song you can feel how much fun they had recording it.